Shashank Joshi catalogues India’s relationship with hard power and its wide-ranging military toolkit. Does India project hard power? If it does, what tools does it use? Finally, what are its ambitions for power projection in the future, as it continues to rise and emerge as a world power? These questions are at the center of a new monograph by Shashank Joshi, a senior research fellow at the Royal United Services Institute. Indian Power Projection: Ambition, Arms and Influence presents, as of 2016, what is perhaps the most up-to-date compendium of information on India’s hard power toolkit and Indian policymaker attitudes toward that toolkit. Generally, owing to a range of domestic political factors and its security situation vis-a-vis its neighbors, India has been largely uninterested in far-reaching power projection since its independence. Indeed, today as during much of the Cold War, the country’s primary warfighting scenarios are against its neighbor to the west, Pakistan, and its larger neighbor to the north-northeast, China. However, slowly but surely, New Delhi has and continues to evolve its capabilities and ambitions away from its neighbors. Though India’s priorities have evolved over time as a function of its economic growth and growing ambition, its interest in hard power–the maintenance and application thereof–has been constant since independence. If anything, the land-based rivalries with Pakistan and China made prioritizing hard power a necessity for India. So what does India have in its hard power toolkit today? An army comprising 1.1 million, a paramilitary force comprising 1.4 million, a navy comprising 180 ships, an air force comprising 880 planes, a hundred-odd nuclear weapons, and a coast guard comprising 90 ships: these are the contours of India’s hard power apparatus. Joshi’s volume contains helpful discussion of the procurement trends, supply shortcomings, and strategic priorities of each of these areas of the Indian military and national security apparatus. Long-time followers of defense and security issues in India will also find welcome discussion of issues that have long vexed Indian thinkers on defense, including the dearth of “jointness” and the shortcomings of country’s defense-industrial base. Joshi’s volume drives home the point that India’s hard power assets aren’t particularly positioned to avail of any particular strategic outlook. Joshi notes, importantly, that due to its “long mobilization times and small munition stockpiles,” India’s supposed conventional superiority over Pakistan is a myth. Additionally, despite facing immediate land-based threats and a volatile neighborhood, new Delhi is investing in assets more befitting of a state interested in expeditionary power projection, including aircraft carriers, refueling tankers, and landing ships. India’s priorities suggest it wants to project power and knows that it will need to project power, but it will remain reactive instead of proactive. Reading Joshi’s volume, I was reminded of India’s continued refusal to put anything resembling a White Paper on defense matters as so many other Asian states–notably, China–do. In a way, India’s propensity for ambiguous posturing explains why New Delhi prefers not to outline its defense priorities for the rest of the world to see, but so much of what is written of Indian defense policy is pieced together from frenzied reporting and statements by officials. Without a white paper on defense, well-researched compendiums like Joshi’s become all the more valuable for analysts, scholars, and policy-makers working on India. India has the misfortune of being located in a complex neighborhood, forcing it to reckon with an uncertain security environment internally and regionally. And while New Delhi might have traditionally lacked an instinct for power projection (with a few exceptions in the Indian Ocean and its immediate neighborhood), it’s need to invest in a robust hard power toolkit has been apparent since independence. While Indian officials may emphasize diplomacy and political engagement as their preferred means for resolving differences (every problem isn’t a nail, after all), India doesn’t have the luxury of letting hard power and military readiness take a back seat. In this context, understanding what cards New Delhi has up its sleeves and how and when it’ll choose to play them becomes all the more important. Is India's Defense Budget Adequate? 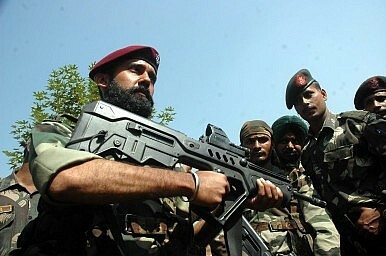 New Delhi's defense spending will rise modestly in the new fiscal year.